Apparently, the Trojans are for real. Many discounted the University of Southern California’s excellent 12-1 start because it was mostly built by beating up weak sisters. The true test would occur on the weekend when the 25th-ranked Trojans had to face No. 7 TCU, No. 1 Vanderbilt and No. 6 UCLA in the Dodger Stadium College Baseball Classic. Taking two out of three would have been miraculous for USC, but a sweep? Holy crap. The Trojans beat TCU 7-6 in 12 innings on Friday, edged Vandy 6-5 on Saturday and then took it to the Bruins 8-4 on Sunday to improve to 15-1 on the season. The Trojans have soared to 14th in the rankings in the wake of this weekend’s success. USC is now in great position with conference play beginning later this week. Freshman Mitch Hart moved to 3-0 with the win on Sunday. He wasn’t exactly at his best, giving up four runs in 5 2/3 IP, but now has a share of the team lead in wins through four appearances (three starts). In 21 2/3 IP, the 6’4″ righty has allowed 19 hits. Hart was a three year letterwinner at Granite Bay (Calif.) HS and last year was a Perfect Game Third Team All American, earning a 35th round selection by the San Francisco Giants. He was a highly touted recruit and could close if needed. Thanks to his fluid mechanics (see video below), Hart easily reached the low 90s at the Perfect Game National showcase. Baseball America lists him 31st in this year’s Freshman class. Another freshman hurler that’s having a positive impact on the Trojans is Brad Wegman, who has been unscored on in limited action (two games, two IP, no walks, one strikeout). 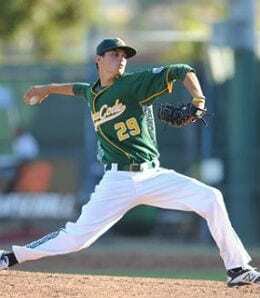 He’s yet another 6’4″ righty that was a three-year letterwinner at Great Oak HS in California. Wegman was a member of the 2014 Perfect Game California All-Region First Team. At the PG National Game, he was cranking it up to 92 mph and reportedly keeps getting better. Look for Wegman to play a bigger role on the team down the stretch. One freshman still waiting to make his Trojans debut is 5’11” righty Bryce Dyrda. A four-year varsity letterwinner at Oakdale (Calif.) HS, he had a composite ERA of 1.34 in high school, earning 20 wins and fanning 225 over 151 2/3 IP. Like Wegman, Dyrda was named to the 2014 Perfect Game California All-Region First Team. Dyrda has plenty of experience missing bats with his fastball/curve combination and he periodically tosses a changeup in the low 80s. Given his size, durability may be an issue, so it will be interesting to see if he can remain a starter. Now it’s your turn. Let us know in the comments below which Trojan freshman you’re tracking.